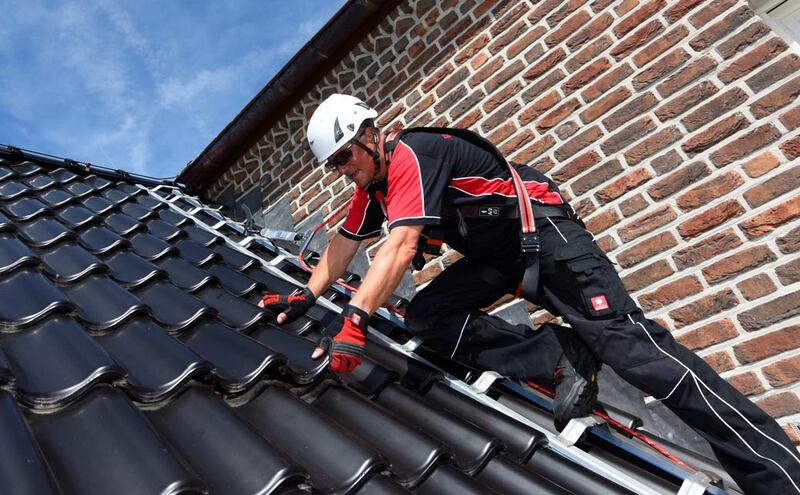 The demands placed on roof hooks sold as construction products in Germany (and Europe) are set down in the EN 517 standard entitled "Prefabricated accessories for roofing - Roof safety hooks". The central aspects of this standard cover the materials from which roof safety hooks are manufactured, their load-bearing capacity and the load-bearing capacity of their respective installation accessories (bolts etc.). The standard also defines the type and scope of the examinations required to attain certification. According to EN 517, roof safety hooks can be divided into two basic categories: Type A and type B. These two categories differ according to the certified direction of load. Products licensed according to EN 517, type A, may only be used and subjected to loads in the direction of the fall line of the roof surface. Accordingly, the user may only carry out roof work when located below the anchorage point. Roof safety hooks licensed according to EN 517, type B, have been tested for "absorbing force exerted in the direction of the fall line (y-axis), in the opposite direction to the fall line (y-axis), as well as at a perpendicular angle to or parallel to the roof surface (x-axis)". This means that individuals using a type B device can move sideways towards the eaves, upwards over the roof hook towards the apex - or even across the apex to the other side of the roof. This standard stipulates the test loads to be exerted on the anchorage point during static and dynamic load testing. EN 517 also contains information on the labelling requirements, on conformity and monitoring the production process. EN 517:2006 is the latest version of this harmonised standard.